Praat is a freely available program written by Paul Boersma and David Weenink. 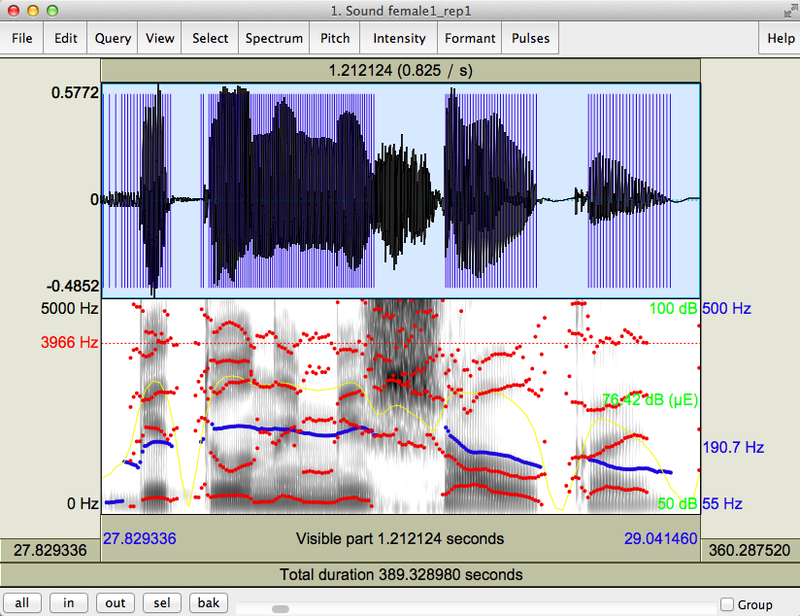 It is primarily intended for acoustic analysis of speech, but it has some additional functions such as speech synthesis and some constraint-based grammar learners. It can even run some basic perceptual experiments. The program is very powerful and has many features, with new ones being added all the time. 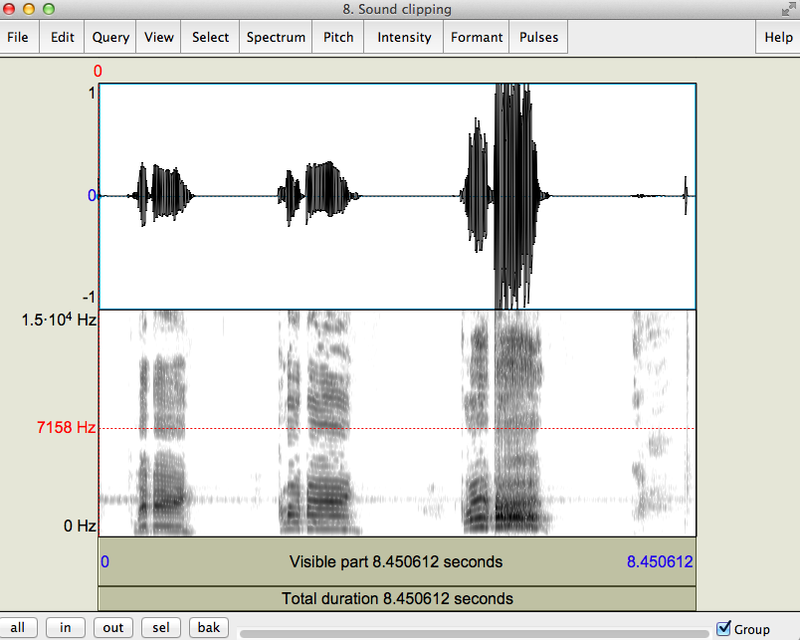 There are only a few features that a beginning phonetician would need; this tutorial covers them. Go to http://www.fon.hum.uva.nl/praat/ and follow the instructions for your operating system. Mac users–drag the Praat.app file into your Applications folder. You may then add a link to the program onto your dock so you can enjoy looking at this icon every day. When you open Praat, two windows appear: the Objects window and the Picture window. You won’t need the Picture window most of the time, so close it. We’ll come back to it at the end of this tutorial. The Praat object window on a Mac. Important: the objects in the Object window are temporary and only exist in Praat’s working memory. If you change the content of an audio file using Praat, it won’t automatically save the changes. If you try quitting without saving the objects, Praat will prompt you to do so. Open Praat, click on “Open”, then “Read from file”. You will see a “Sound” object appear in the window, which you can then “View and Edit”. In Mac OS, you can also drag your audio file or files onto the Praat icon. All of the files will then appear as sound objects in the list at once. See if your OS supports drag-and-drop opening of files. Depending on the length of the recording, you will see either the waveform with an empty window below it or a waveform above the spectrogram. The two lines of black squiggles labeled “Channel 1” and “Channel 2” are your two stereo channels. Here, we extracted just one channel (the top one, recorded with the “left” microphone). Now we have a mono sound. 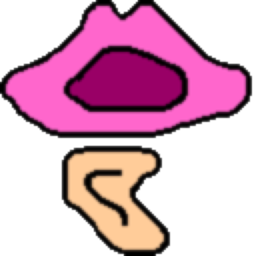 For speech analysis, you do not need stereo, since the vast majority of humans have only one mouth. Return to the Objects window. Select the stereo Sound object. Select “Extract one channel”. Unless the two channels are really different from each other, you can just accept the default, “1/left” channel. The new object will have the same name as the old but with “_ch1” appended at the end. Don’t forget to save it if you want to use it again. You can record right into Praat, as long as your computer has a built-in microphone. Most likely the recording will not be of awesome quality, but it’s fine for practicing with the program. To record a sound, click on “New>Record Mono Sound”, and hit “Record” in the window that opens. You can accept all the defaults in that window. 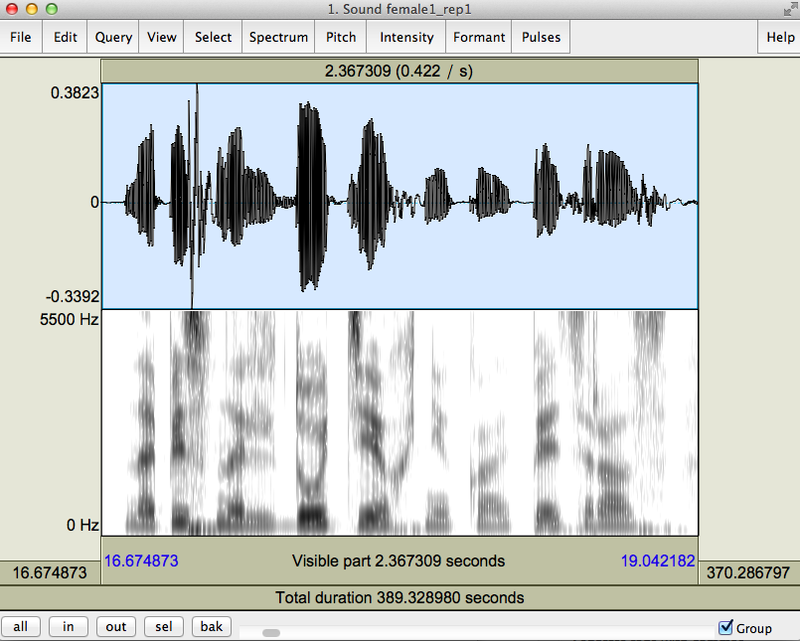 A waveform and spectrogram of a sentence I recorded straight into my MacBook Air using Praat. When you record audio for speech analysis, you want the signal to be as loud as possible without exceeding the range of your microphone’s sensitivity. Look at the black number in the upper left-hand corner of the screen, next to the waveform. Your recording should get as close to 1 as possible, but the waveform should not protrude above it. If the amplitude of the recording exceeds the range of the microphone, you get clipping. A clipped recording is missing parts of the signal, and it sounds awful. Avoid. Here is what clipping looks and sounds like. I had to pretty much yell at my laptop to get this to happen, so you’ve been warned. Your Praat recording widget has a meter display that stays green while you’re in good range and turns red when you are in the clipping range. The last “clipping” is clipped. See how the waveform extends outside the waveform window? Once you have a Sound object, you could just hit “Play”. Usually, we want to play only portions of a file, sometimes repeatedly as we try to transcribe or determine the boundaries of a segment. To play portions of a file, click on “View & Edit”, and make a selection with your mouse. The playback options are in the “View” menu. Yep. I actually had to look for this just now because I usually play back the selection using the Tab key. Tab will also stop playback. Shift+Tab plays the visible window. For Mac users: I’ve used a Mac for over a decade now but I still cannot keep track of the little symbols that apps use for keys. Here is a reference. There are many things you can do to edit a file. Perhaps the most basic function, and one that you might find useful long after this class ends, is to cut out parts of a file. First, open the Sound object of your file in the View & Edit window. Make a selection you want to keep, using the mouse. If you want to make a really neat cut, you can “Move start of selection to nearest zero crossing”–this is an option at the bottom of the “Select” menu. Then do the same for the end of the selection. What this will do is adjust the selection so that it starts and ends with a silence (zero amplitude). Then click on “File”, and you have several options here. You can put the selected sound into its own sound object, if you want to keep doing things to it (“Extract selected sound”, either preserving the time markings from the original file or resetting them to zero seconds). You can also save the file to disk. There is a range of options, but a .WAV extension is the basic one. 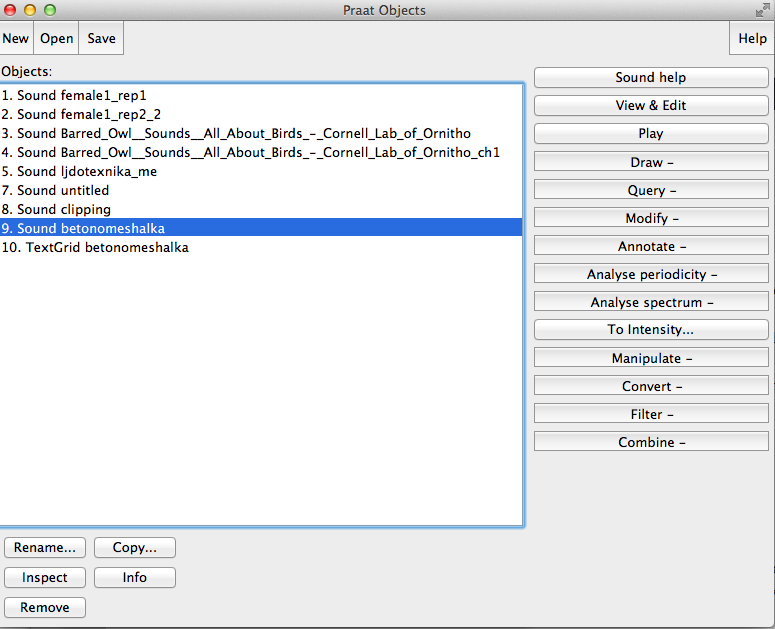 The options above do not alter the original file or the Sound object in Praat’s memory. If you want to modify the Sound object or the file, you can cut a portion of it out–useful if you have a long period of silence, or if you want to make someone say “got” instead of “Scott” or whatever. This is done via “Edit>Cut”. Once you cut a portion out, it is placed on your clipboard (computer’s working memory); if you then save the Sound object to the original file again, the file will be permanently altered. If you do not want that, save it under a new name instead. You’ll see other options in the menus, which are more or less self-explanatory. Feel free to play around with them, and remember that nothing is permanent until you save to disk. Praat can only display spectrograms for relatively small chunks of audio, so if you want to see a spectrogram for a word, zoom in on it. You can select a part of the recording with the mouse, and then use the View menu to zoom to that selection. The View menu is fairly self-explanatory. There are keyboard shortcut hints in the View menu and many other places in Praat! Use them. I use Cmd+N to view the selections on Mac OS. Here is a waveform and a spectrogram of a female Russian speaker (not me) saying [napʲisənə lʲdotʲexnʲikə pʲatʲ ras] “The word “ice technology” is written five times.” This sentence is a bit over 2 seconds long. 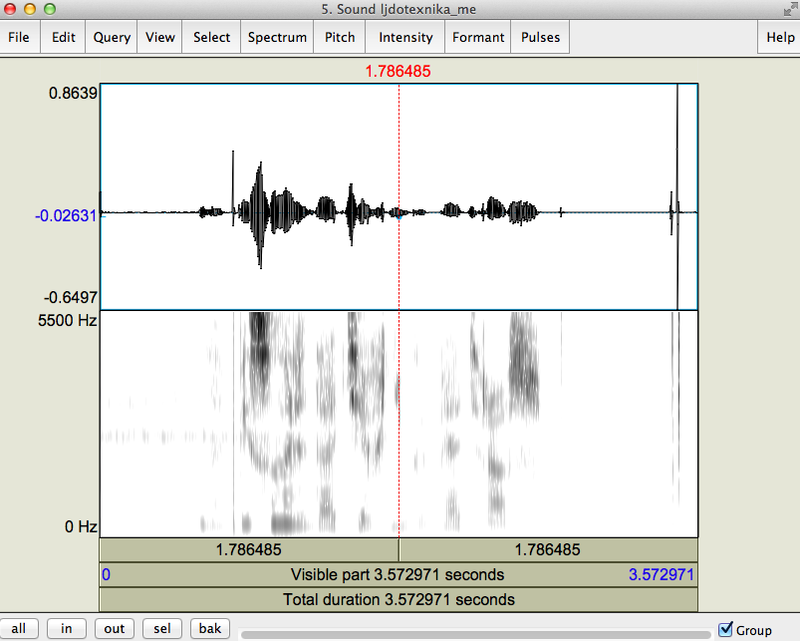 A waveform and a spectrogram of a 2-second Russian sentence. If you are working with a fresh install of Praat, your spectrograms most likely will look a lot more gray than the ones you see above. This is because the dynamic range is set very high in Praat by default–at 70 db. You want something like 30-50 for a recording that has some background noise. The obligatory metaphor: Dynamic range refers to how low the cut-off is for the volume of frequencies that the spectrogram visualizes. The lower the number, the less you see. Think of it as taking pond water out of a bucket. The deeper you dip, the more muck you’ll scoop up. If your pond (=recording) is very clean, then you can dip pretty low (i.e., have a high number dynamic range). If your pond is mucky and dirty, then you better skim from the top (i.e., have a low number in your dynamic range). The same recording of me saying that “ice technology” sentence, with a default dynamic range of 70 db. The two bands of noise are from the air conditioner in the background. To set the dynamic range, click on “Spectrum>Spectrogram settings”. Change it in 5 db increments until it looks good. You can also change how high the frequencies go in the spectrogram display. The default is 0-5000 Hz. You can expand it quite a bit–some fricatives have noise at frequencies above 12000 Hz. This is pretty simple. While you have the Sound object open, click on “Pitch>Show pitch”. You will see a curvy blue line appear in the spectrogram window. In Pitch Settings, click on “drawing method” and select “speckles”. I think it looks better than Praat’s default, “automatic”. Click on “Intensity>Show intensity”. A yellow line will appear in the spectrogram window. Praat can also show you formants, and you can probably figure out the procedure for those on your own. There is one thing you will have to change in the Formant settings depending on whether you are looking at a male or female voice: the maximum formant should be set for 5500 Hz for female speakers, and 5000 Hz for male ones. These formant dots are estimated by Praat; you cannot always trust them. 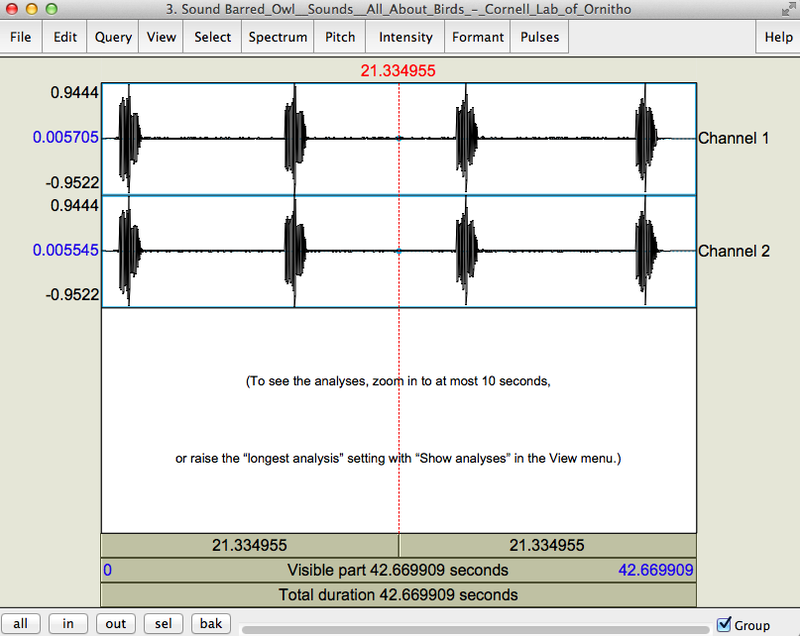 This method visualizes glottal pulses that show up in voicing. If you turn “view pulses” on, you’ll see vertical blue lines wherever Praat thinks the glottal pulses occur. Here is the Russian word [bʲitonəmʲiʂalkə] ‘concrete mixer’ with the pitch track, intensity, formants, and pulses turned on. You would rarely need to see all of these things at once, this is just for demonstration. Pitch track: blue line, intensity: yellow line/green numbers, formants: red dots, glottal pulses: blue vertical lines in the waveform window. A TextGrid object allows you to mark certain periods or time points in a sound file. You can have several tiers in a TextGrid: one to mark word boundaries, another to mark consonants, vowels, whatever you want. You can type into the TextGrid using IPA fonts. See this page for more information on how to set up your computer so that you can do this painlessly and quickly. Praat distinguishes between “point tiers” and interval tiers. To create a TextGrid, start from the Objects window. 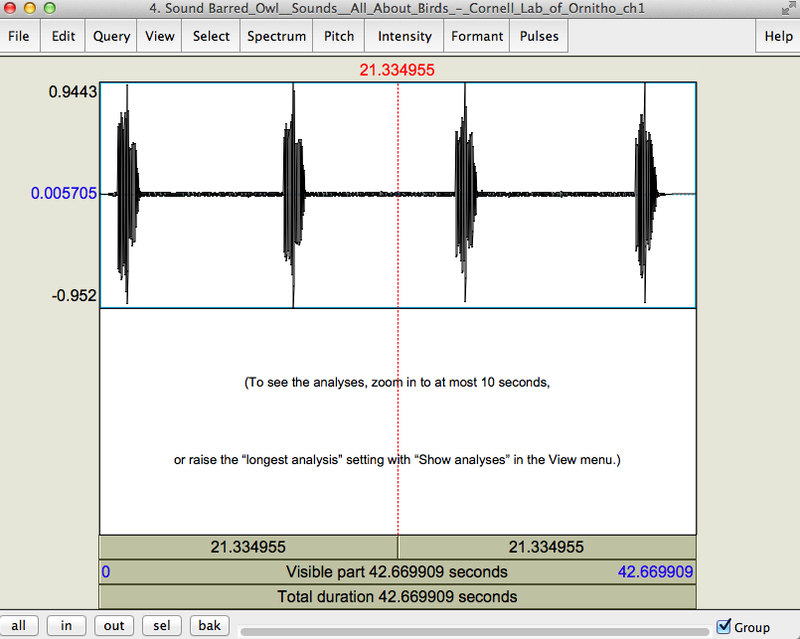 Select your sound object and click on the “Annotate” button to the right. You’ll see this window. Why the program suggests “Mary John bell” as the default tier names is a mystery to me. You can either name all your tiers at once, as shown here, or name the first one and add more later. I named my three tiers “word, segments, vowels”–you see them in the screenshot below. Now comes one of the Praat gotchas: “View & edit with sound” is highlighted, and you would think that this would allow you to view your sound file and edit the TextGrid at the same time, but no. Clicking on that button just tells you that in order to do what you want to do, you have to select both the sound and the TextGrid in the objects window and click on the “View & Edit” button. 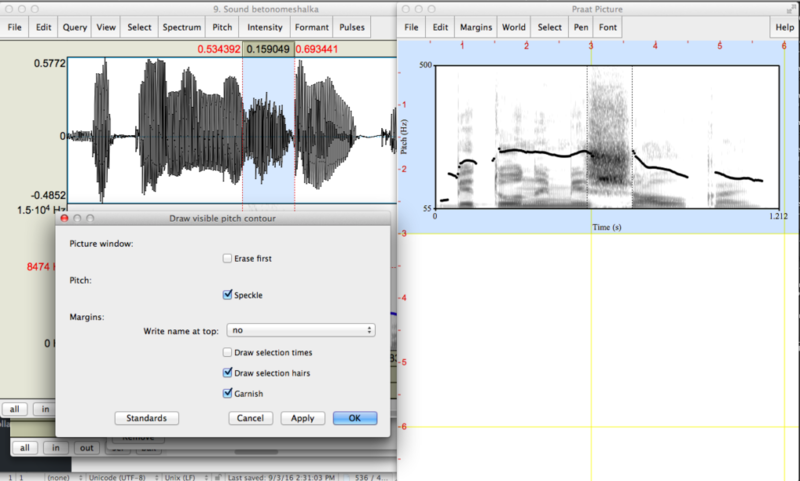 You can select the TextGrid and Sound objects with the mouse or with your keyboard keys. On a Mac, Shift + arrow (up, down) will let you select two adjacent objects in the window. If you have more than one object in the list, make sure you select the TextGrid that goes with your sound file! Once you are in TextGrid edit mode, you can add text on tiers, copy interval boundaries from one tier to another, and navigate between tiers and between intervals using either the mouse or just your keyboard–make sure to poke around the “Select”, “Interval”, and “Boundary” menus to see all the options. A TextGrid with three interval tiers, labeled in the International Phonetic Alphabet. Make sure you save your TextGrid when you are done. By default, the TextGrid will be given the same name as your sound file, and the extension is .TextGrid. Finally, we get to the mysterious Picture window. 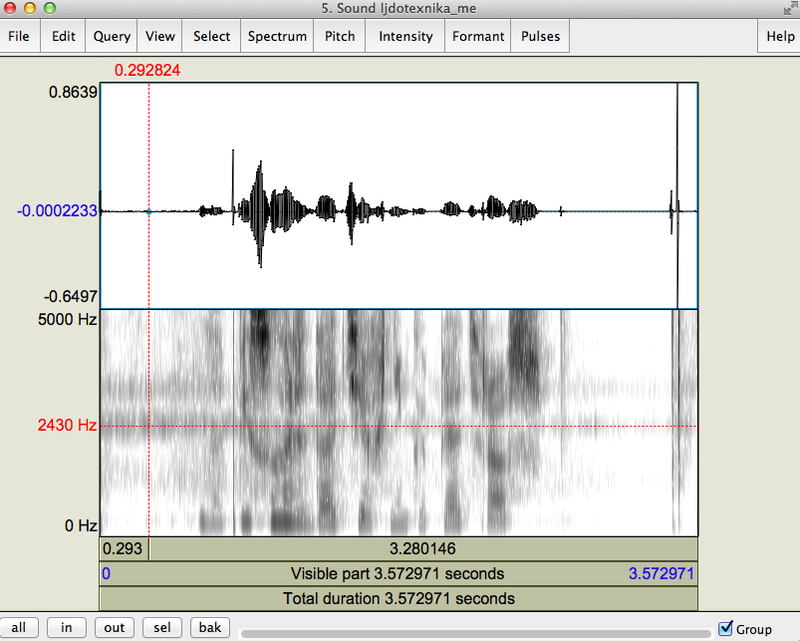 The point of the Picture window is to make professional, publication-quality images from your spectrograms, waveforms, and whatever other aspect of speech that you use Praat to visualize. Whenever you see a “Draw” or “Paint” option associated with an object, it refers to the Picture window. For example, open a sound file and click on the Spectrum menu–you’ll see “Paint visible spectrogram” as an option. The same “paint” option is available for intensity, pitch, formants, and other views. To make a spectrogram picture with a pitch track overlaid on top, I “painted the visible spectrogram” and then “painted the visible pitch” while unchecking the “erase first” box. This superimposes the pitch track on top of the spectrogram picture. Poke around the menus, check out the options, and see what “Garnish” does. 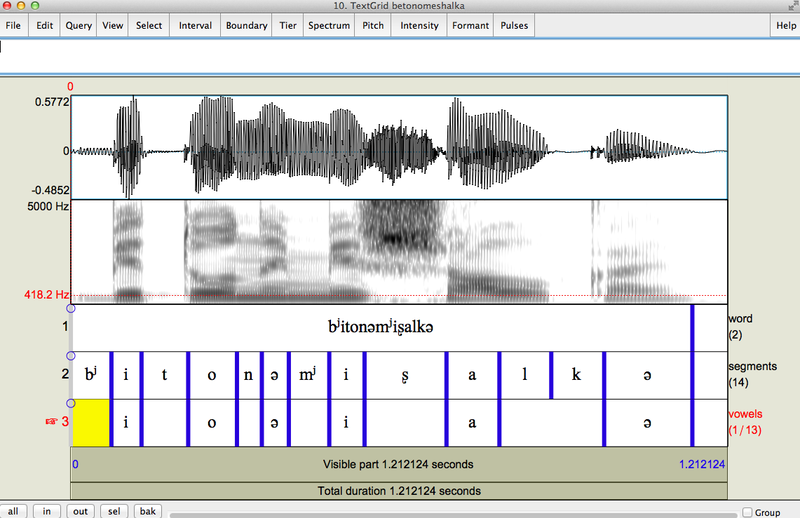 A nice picture of the word [bʲitonəmʲiʂalkə], with a speckled pitch track superimposed in black. To get a sense of the full power of this program, you can just look at the various collections of Praat scripts that people have made available. Praat uses its own scripting language, which is based on the commands in the program’s menus. Record a word list, cut it up into smaller files at silences automatically and label all the smaller files from a text file you specify. If you have to label a lot of audio files, you can automate opening and TextGrid creation. You can also automate the collection of durations, intensities/pitch at various time points, Praat-estimated formant values, and so on. To get a sense of all the options, do a web search for “Praat scripts”. I really like Mietta Lennes’ page, but there are many others, such as this Google Sites archive. There is also the actual Praat Help, which you can search.